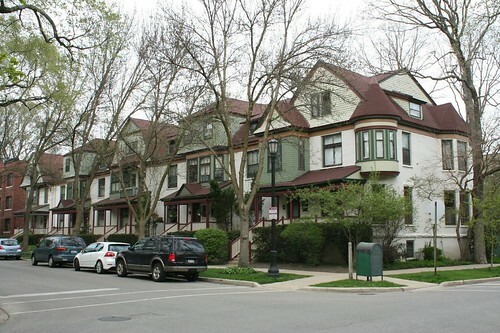 The rowhouse form never caught on in Chicago. With limitless room for expansion and an endless supply of timber from the forests of Wisconsin and Michigan, the city that sent the wood balloon frame upward to fame had little use for conjoined party wall housing. Older East Coast cities like Philadelphia, Baltimore and Boston packed their houses cheek to jowl (the former two in particular are completely dominated by red brick rowhouses). 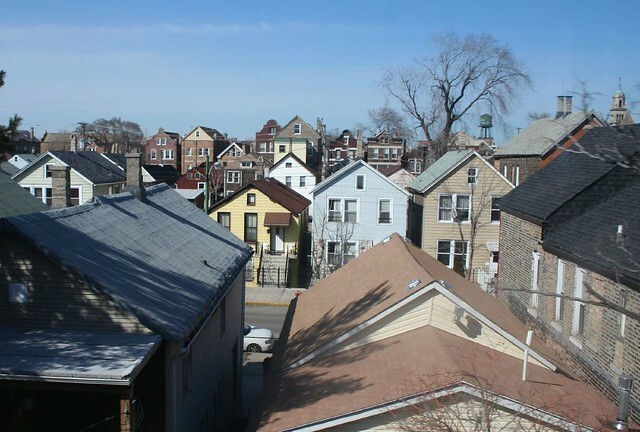 Instead, Chicago’s landscape is dominated by free-standing brick two- and three-flats, brick apartments, and wooden balloon-frame single family cottages – closely packed, but never touching. New, teeming Chicago offered the working man a chance at his own house and perhaps a break from the ingrained, stratified ways of the older cities. The scattered rowhouses that were built, therefore, exist more as curiosities and experiments, rather than shapers of the urban landscape. Those experiments took a particularly interesting form in the inner-ring suburban town of Evanston. 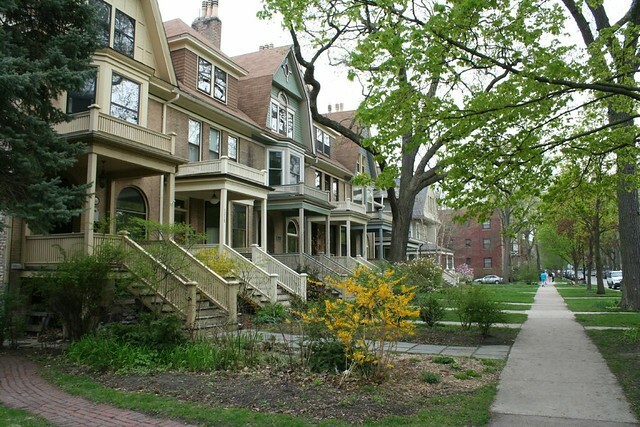 South of downtown Evanston, these three sets of rowhouses are standouts on streets already notable for their lovely houses. These were not the mass-produced meatgrinder products that local builders churned out in the industrial East Coast cities. These were high-class, high-design buildings meant to integrate with their tony suburban neighborhoods, without the neighbors batting an eyelash. The 1890 building is almost pure Shingle Style; the 1209 Maple building is predominantly Queen Anne; the third building splits the difference, with turrets alongside shingle-clad hipped gables. 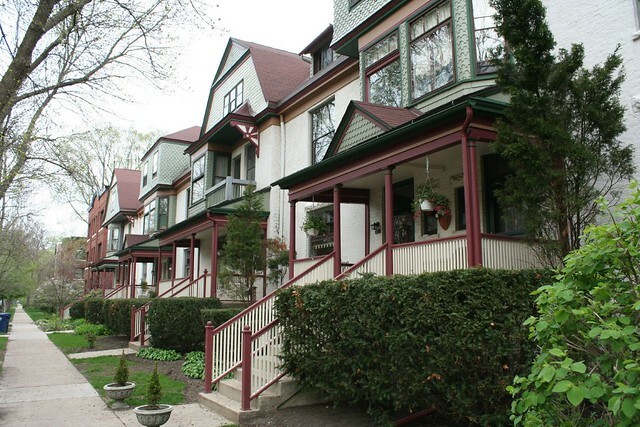 As the National Register form notes, they achieved this by striving for the appearance of single-family homes. 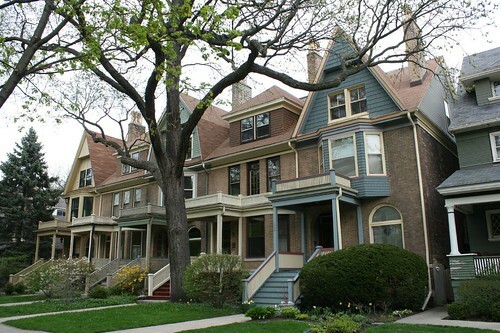 The two Maple Avenue examples are particularly successful in this regard, using Queen Anne elements of bay windows, projecting turrets, and generous entry porches, as well as gabled roof ends, to break down their massing to a single-family scale. The Shingle Style building at 1401 Elmwood is a bit more anomalous, as its massing is in tension with itself. 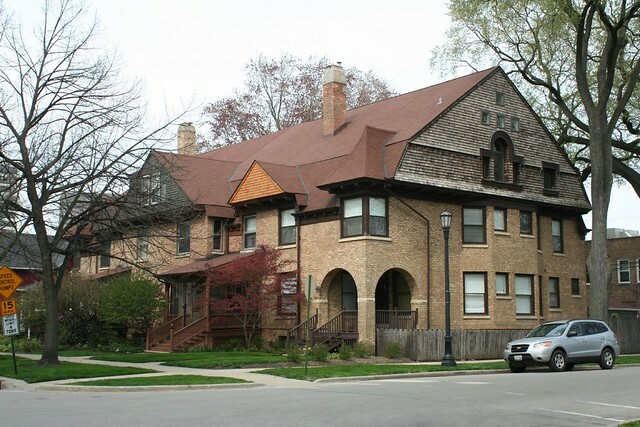 The massive hipped gable roof suggests a single large building, while the small corner arched entrances and scattered bays and gables suggest the smaller scale of a single family home. In addition to their compelling beauty, these three rowhome groups suggest the possibilities of dense suburbanism – that it need not be unattractive or stifling; that we can use land intelligently and rationally as well as attractively. This entry was posted in building types, Victorian architecture. Bookmark the permalink. 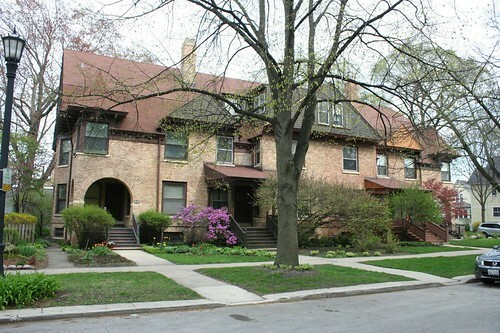 I live in S Evanston and have always loved those two Mape Ave row homes. Thanks for the post.